MARCOM's "Dealing with Drug and Alcohol Abuse... for Managers and Supervisors" Safety Meeting Kit discusses the various forms of substance abuse that are typically found in the workplace, how managers and supervisors can detect substance abuse problems, and what they should... and shouldn't... do if they discover a worker with a substance abuse problem. Substance abuse in a huge, worldwide problem. An employee with an alcohol or drug problem can decrease productivity, create a hostile working environment and damage a company's good name. Worst of all, the actions of a worker who is "under the influence" can completely undermine a company's efforts to keep people safe. Materials in the kit include a video program, five motivational posters, and 30 employee booklets. 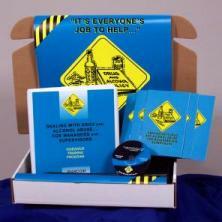 The posters in the kit remind managers to be aware of drug and alcohol abuse in their workplace. The video program and employee booklets include information on how substance abuse can affect a workplace, laws and regulations related to substance abuse, the role of education and testing in preventing substance abuse, recognizing on-the-job substance abuse, and more. The video program in the kit comes with a comprehensive leader's guide, reproducible scheduling & attendance form, employee quiz, training certificate and training log.